We all know that our truck exhaust pipes get noisy from time to time because the pipe has become a little slack and needs to be fixed quickly. A lot of the times it can be that you have to take a few safety measures when your tailpipe stops working when you are at the side of the road so you are going to need to know what you should do. When your exhaust stops working properly then gas could be coming into your truck without you even knowing and you should know that all and any problems needs to be fixed at once. A lot of the times when you find you have problems with your exhausts then it is the tailpipe which is lose and needs to be kept secure. So you might have to try repairing this as a temporary measure until you get back home or to a garage. You really can’t start any repairs while your exhaust pipe is hot because you won’t accomplish anything other than hurting your hands and getting burnt from a exhaust pipe will hurt so do be careful and wait before you start any work by letting the exhaust get cold. It might be twenty or so minutes or even an hour. You should take an old coat hanger – which should be wire so that you can straighten this out and then get in position under your car so that this will be looped to your tailpipe to keep this secure. This could be the best way or repairing it but you should check first by driving a few minutes with the car and see if it is still there and secure or if not then you will need to make the wire a little tighter. This step is an emergency step however so don’t think this is a long-term solution to you problems. If you do have problems with your exhaust pipe then it could be that you need a muffler clamp installed; you have one already installed but this is probably too old and needs to be replaced again. 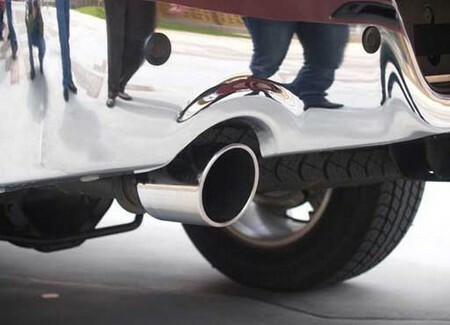 This helps keep your tailpipe on your truck but if it has been damaged or is worn away then you should think about getting a new one installed because it will be loud because it might rattle against the truck. With this you will be using a bolt to keep your clamp in place so you need to be careful and remember to keep it tight and in place. You might get some problems with your exhaust because there are damages to your muffler meaning you are going to have to fix the holes or leaks that it has. This should be fixed immediately because this has gas running through the exhaust pipe. If you have a small hole in your muffler then it could be repaired easily or it might take a long time because you could use an epoxy or a putty mixture. You have to make sure that the muffler is all cooled down first before you think about fixing these. If you are using putty mixture then you are going to need to get a big layer on the muffler first where you have the problems. It will probably be an orange color and be quite smooth; this is going to take a few hours to dry out. 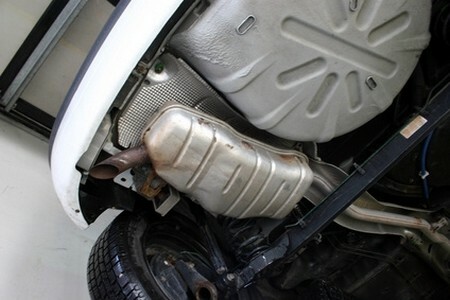 If you want to use some Epoxy then it could be best if you have got bigger hole in your muffler; the problem is that if there are too many holes which are too big to cover then this might not be the right solution for you. If there is only a small sized hole then this would be OK to use; you are going to have two parts to your epoxy. You will have to start mixing them together so that you can repair your muffler. Before you start any repairs then you need to make sure that your muffler is cooled down and then once you have put your paste onto your muffler then you will need to leave it to dry for a while. A night or day could be the best time frame before you can reuse your truck again. If you have a truck then it is wise that you should think about cleaning the truck properly every so often but you should also think about steam cleaning the trucks engine every few years so that the engine will be in a very good working order. This helps to remove any grime that has built up as well as some mould or mildew which can affect the problems of your running of the car. Drivers of big rig trucks, whether working for a third-party logistics company or and owner-operator of their own fleet, must know the proper ways to clean and maintenance their vehicles. This helps you to know if there are any leakages in your engine or some corrosion also; so cleaning the truck engine is very important thing that you can do when it comes to maintaining your truck. This can be done by you and it will only take you a few hours to do so, so why don’t you try steam cleaning the engine yourself. What you need to do first will be the tools; you need to get everything that you will need to clean your car out; so getting a hot water steam cleaner for you. This should be for an advanced wash which would mean that there will be less water actually used but still this helps to remove all of the dirt and grime that has built up in your car. Check on your engine temperature on your car so that you can start cleaning your car properly but you need to cool down the engine first before you can start the engine perfectly. You don’t want the engine to be too hot so no parts of the engine is damaged or broken; if you work when the engine is too hot then you could get burned also so be careful. Prepare your engine bay so that you can spray your engine with some form of degreaser for the different parts of the engine. If there is any grime on your car then this will help to remove it all before you can move on with the next part. If you have any sensitive parts of your engine then you should cover them up so that they don’t get any damage done to them when you are steam cleaning your engine of your truck. Now you are going to have to do all of your steaming and drying on your car so take your steam cleaner and then use this over your engine surfaces but be careful that you don’t get anything on your face. 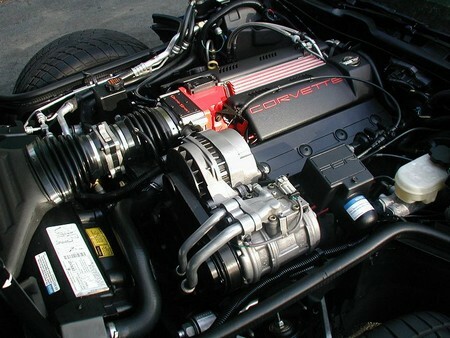 You really do need to make sure that every part of your engine so that means every part of the engine and the car also. Now all that you are going to have to do since you have cleaned your engine is to put some wax onto your engine bay. You should put wax on everything and anything that may be a little corroded. You could also put some hosing components on if you really do believe that you need something on your engine. If you have a truck then you could get yourself a bed liner for the truck; this would be great for any truck to have because if you ever plan to sell the truck then it could increase your price of what you could sell your car for. 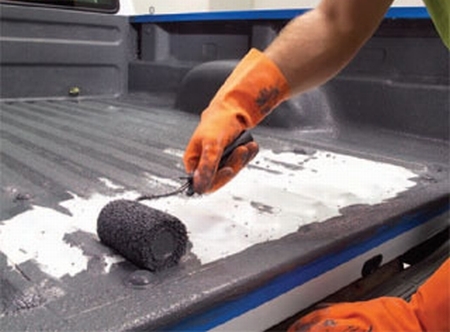 These bed liners can help protect your truck but just like everything else out there you could find that there is some damage done to the bed liner which needs to be fixed for the truck to be completely once more. If you want to find out how to then follow these rules to help you do your own repair work without all that hassle; here is what you will need. Now you need to make sure that your car and its surface it clean and tidy so that you can start your repair work without any problems. You should try to do this in your garage if you have a lot of light in there or out on the driveway so that you can get a lot of the sun shining down onto your car so that you can see properly. Get some detergent and water and use an old rag to start washing off the dirt on the car and then dry the car off. If you find there are any rusting beginning to happen then you need to take a piece of steel wool and then remove all of the dirt around it. You can now sprayer on some liner on. If you have a big area in which has been damaged then you are going to have to repair this but it won’t actually take an hour or so to replace so you need to start with spraying the car. You should get a paint sprayer which has an air compressor so you can work evenly around your truck bed liner; if you don’t want to spray all of the car then seal off the part which you don’t want to before you start spraying. When you spray you should make sure that you follow all of the instructions that comes with your paint sprayer but don’t go overboard with this just a thin layer over the damaged area. Only a few inches of where the damage is should you use your spray so that you can attach your liner. You need to put your liner material into your paint tray and put your brush into this tray and then begin to work on your damaged area. If you have only a small area that has been damaged then just let the material drip down onto the area but let this settle for a few days to make sure that it is all dry. When you have a truck then you will need to get some repair works done a lot of the times because even if the vehicle is new then you are going to have a few repairs needed because of general wear and tear. Your body panels will often get some marks and scratches to it and then you think that you are going to have to go to your garage and pay thousands to get it repaired but you can do this yourself without costing you too much. You need to start off by cleaning up your panel; you need to get a bucket of water and a sponge and start cleaning the truck, you could get all of the truck cleaned if you want since you are going to be cleaning a part of it anyway. Take away any dirt you find and then dry with some absorbent paper so that is minimizes the damages to your car. When it comes to the scratches on your car then you will have to fix this by removing these with getting some wet and dry paper and sanding the area down so that you can keep the right color to your car but lose the scratches to it also. You don’t want to sand too much and lose half of your paintwork so do be careful with this part. Wetting the sandpaper could really help stop any more scratches from appearing on your car but it shouldn’t be roughly applied but gently. You should try this with a small area first so that you can get the hang of how this part should be done. You don’t want to go on for minutes at a time so stop every five seconds to see if you can still see the scratch and if not then continue until the marks are away. Now you need to start polishing your car; you need to clean it first however so wash it and then clean your panel up by using some absorbent paper. Now you can bring that shine back to your beautiful truck; you need to get some polish but you will need to use only a small amount of polish however. You could get a mechanical polisher to help speed up the process long enough but you should just work on the parts which need to be polished up so that you can get a lovely shine to your truck. If you find that there are a lot of scratches still then you should try to use some wax to help cover up any scratches there may be on your car. You shouldn’t be using too much wax otherwise you might damage the paintwork so take an old cloth and use a little bit of wax and then add to your car in a circular wave so that you can get a great looking car and finish to the car. 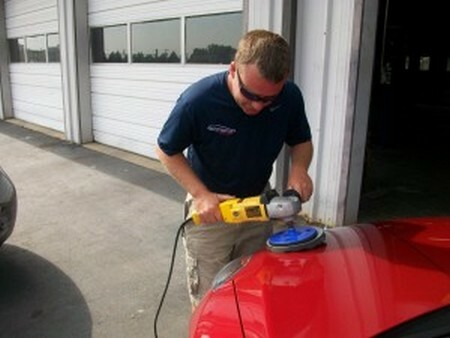 Now you have repaired the scratched to your truck and have a truck as good as new. A lot of us will need to complete some repair work on their trucks especially with their rear window seal because it is not working as it should be then you should know that you might have to replace your window seal but you don’t need to worry it can be fixed without having to spend a lot of money and won’t take a lot of time either so here is how you can repair you rear trucks window seal. 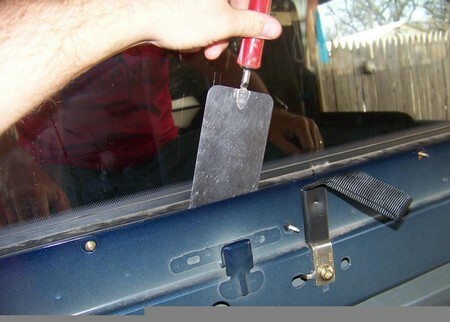 You need to firstly remove the trim that might be around your rear window but this is easy to do; you need to get inside your car and open the window in question to remove your window seal. There will probably be a few things that keep the seal in place like a clip so you can remove these and then remove your trim. You will need your trim stick to do this so take care. Next you need to pry off your old seal so you need to get inside of the truck and take your screwdriver and start to remove the seal. Now the seal is made from rubber and you will have to pry it off with your screwdriver. Now you need to take out the glass from your window. You need to remove your rubber seal gasket which you have done in the previous step and while you are doing this then you can help remove your glass. You don’t want to force the glass out but be careful and gentle while you remove the glass otherwise you might crack the glass or drop it out of the frame. You can slowly remove the glass and then remove the rest of it when you step outside the truck and do so from there. Now you need to remove your gasket seal; after you have removed your glass window then you are going to have to remove the old gasket seal from your window and can move on to your next step. Now you can install your new gasket seal; you should have your new seal so you need to install it by putting this into your rear window. You need to put this around the edge but you need to have this secure in place at your window; you could use a nylon cord to do this part and sew it through your seal securing it. You will need to add your lubrication to your seal; you should use some hot soapy water for this part and put it around your seal and the frame of the window also. Now you can put back in your window again; get someone else to help you so you don’t drop the window and have to repay to get another window put in. You need to help put the window back by taking the nylon cord and help slip back through into its frame. Now you have repaired your window seal.